Beachbody On Demand is now a thing. You can stream Body Beast and every other Beachbody workout online whenever you want for $99 a year ($8.33 a month). This is what you want. With your Beachbody On Demand membership you can download the files to your computer. At that time you will be given an encryption key from Beachbody to access the files. As long as you keep your account active you will be able to view the files. I’m sure you’re probably looking for a way to download Body Beast for “really” free as this option isn’t truly free. I get that. Before you hit the back button I’ll tell you right now there are torrent websites out there with the Body Beast workout available for download. What you don’t get with the free download or torrent is the Body Beast workout calendar and the “Book Of Beast.” Its a 135 page book that contains a meal plan, info about the Body Beast supplements, and other stuff about getting huge. If I did not read it before starting Body Beast I would have been lost. Beachbody did throw us a bone and offered up some of the Body Beast stuff for free. Here is how you get it. Create a free Beachbody account. After doing that you need to go to the Get Fit and Eat Smart tab. 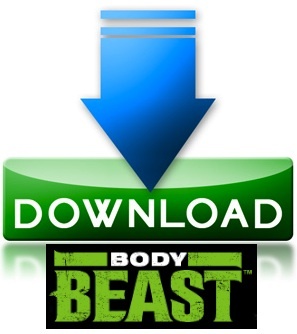 Download the Body Beast workout sheets for free. Then input your numbers into the calorie calculator to determine how many calories you need to eat for Body Beast. You will find a workout tracker and tons of people on the message boards talking about Body Beast. Probably the best part of the free account is I will be your Beachbody Coach. What a deal! I’ve completed Body Beast and had great results. I know what you’re getting yourself into and will be there to answer questions when you have them. I don’t work for Beachbody so please don’t think I’m going to report you to Beachbody if you do decide to download the Body Beast workout for free or its torrent.